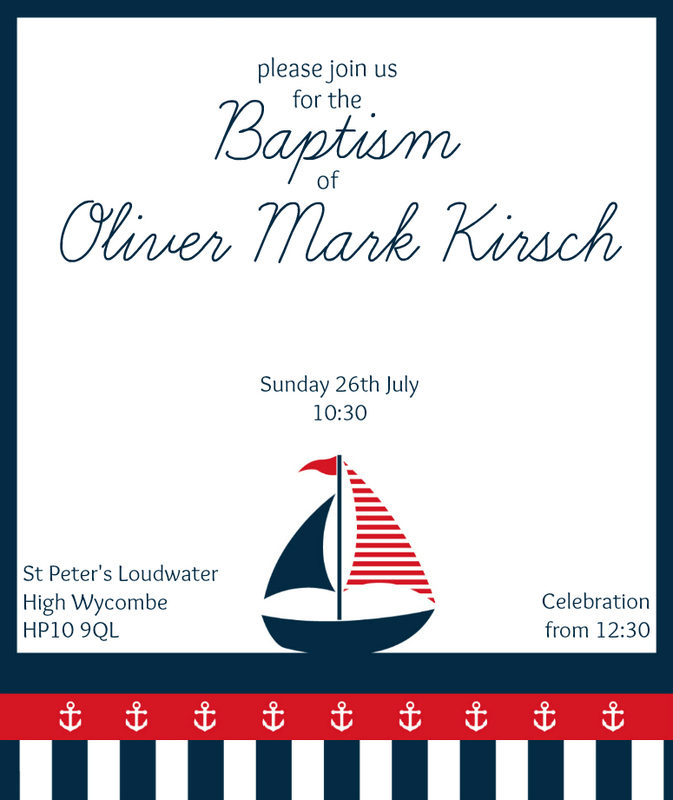 At the end of July we held a Baptism for Ollie. It was such an important day for us. The welcoming of our son into God's family. A commitment to bringing him to know God. It is also one of the best reasons to celebrate! The start of an incredible journey. Our budget wasn't huge. For us, it was more about having a family day. Being surrounded by our family, friends and church family. We were able to keep costs down by hiring out our church hall for a couple of hours after the service and doing the majority of the details ourselves. I knew I wanted a nautical theme straight away. 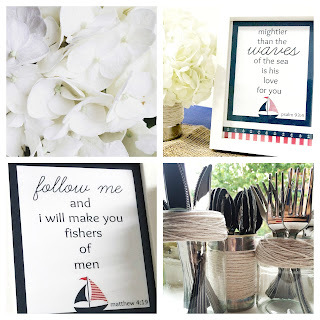 Luckily, I found these great free printables from Catch My Party, downloaded them and adapted them in a photo editor to get exactly what I wanted. I was then extra lucky to have a friend from Avery print them for me using their specialist products. I sent invites to family and Godparents before inviting everyone else via Facebook to save more pennies. I also found that keeping track on Facebook made the organisation so much easier - I could see who had responded and also update our guests with information about parking and creche facilities. OK, so the church hall isn't the most glamorous venue. But I still wanted to put the effort in. We kept it simple - balloons, bunting, and small handmade touches like tin-can vases wrapped with twine. 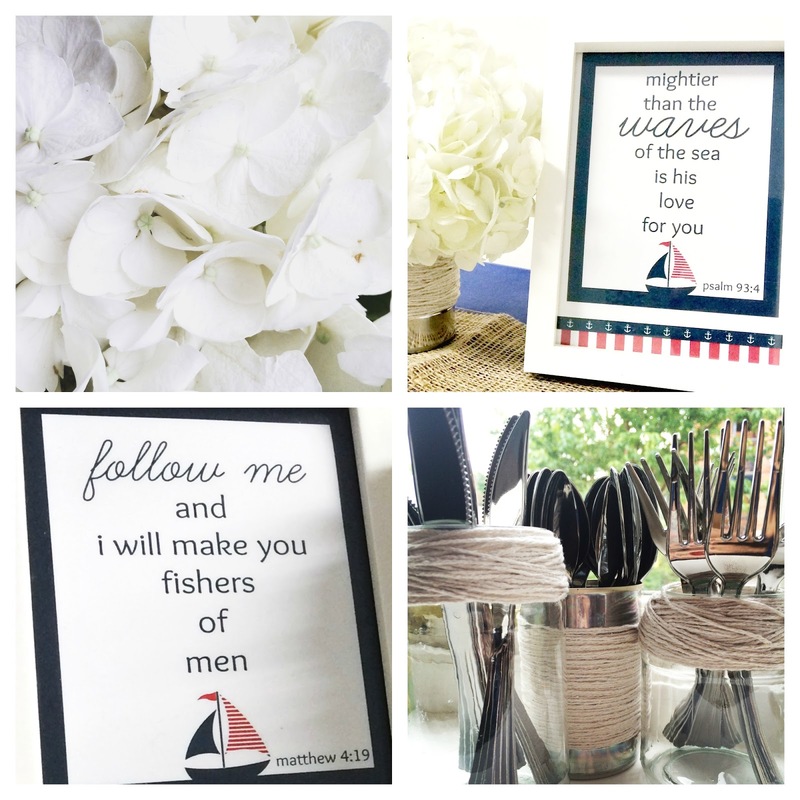 I printed bible verses and displayed them in plain frames. I used simple hessian for the table runner and have tons left over (clearly need to plan more rustic parties). I printed little menu cards from the same stationery set as the invites and I gave the vases of hydrangeas to the lovely ladies who took the time during the service to help me set up the buffet. Our guests really came into their own when it came to our buffet. We organised a bring and share and it was wonderful how generous everyone was. We provided some savoury dishes ourselves, but in addition we given handmade sausage rolls, handmade flapjacks, cakes, cheese boards, fruit, crisps and even individual homemade trifles. I was amazed (and thankful, obviously) by how lovely it was. I love baking but I'm not great. I find my cakes taste lovely (if I do say so myself) but tend to look shite a bit shoddy. It's made harder by the fact that my Mum has always made really cool cakes, and growing up with people exclaiming "Wow!" at every wonderful baked creation has left me craving the same reaction. And so I was determined to do Ollie's cake myself. From beginning to end. I wouldn't say that my blood, sweat and tears made it into the finished piece (because that would be gross) but it was hard work and I stressed more than a little bit. Still, in the end I was pleased with the result. It didn't match the image I had in my head when I started, but I was pleased. It seemed to go down well. I liked it anyway. And as I was the one left at home on the Monday eating the leftovers, I guess that is just as well! All in all it was a lovely day. 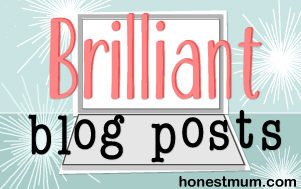 It seemed to be over far too quickly, but then I find that whenever I plan a party or event. All that effort for a couple of hours and in the end you're left with some photos and (hopefully) really special memories. And cake crumbs. 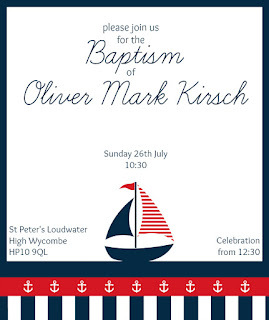 If you're planning a nautical themed baptism then you can pop over to my Pinterest board where you can see where I nicked a lot of my ideas from!